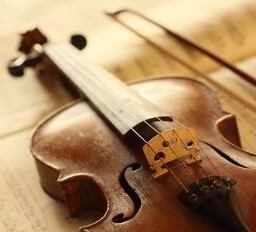 Shock Rock Enterprises in Austin, Texas, provides the solution to educators who spend hours working with students on the proper bow hold with a tool that works with violin, viola, cello and bass bows. Even older students can use this innovative device to improve bow hold. This new tool we call the Fedget ® is easy to use and clean, and it is made right here in the USA. Our team understands the needs that music educators across the country have. 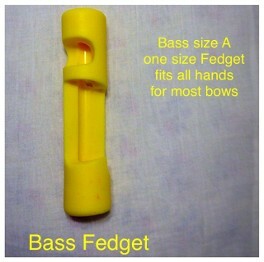 That is why we developed the Fedget ®, to be a quick and convenient demonstration tool for the proper bow hold. 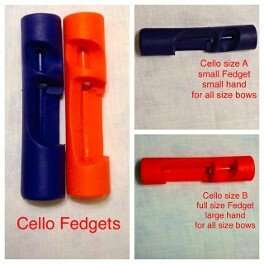 This product for violin and viola is patented, and the product for the cello and bass is patent pending. 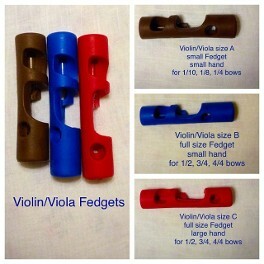 The Fedget ® places the fingers of children and adults into bow holds and allows them to feel the proper grip right away. This product helps advance the hand to the proper hold and can be easily placed on the bow, without the need to take your bow apart. The Fedget ® is made from polyurethane, and is easy to clean with just a simple alcohol pad. We have tested this product with students as young as five years old, and found that training memory is quickly established. Contact us for a flexible new teaching tool/guide for learning and improving the bow hold.